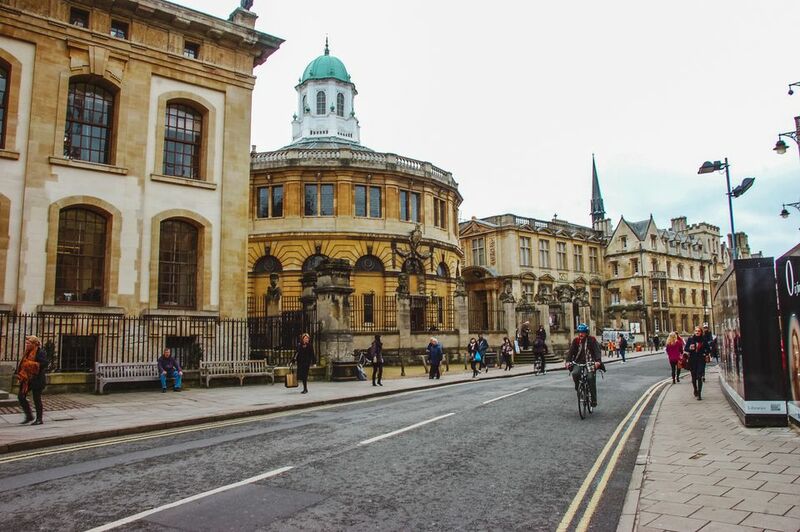 Getting from London to Oxford, only 60 miles away, is easy and there's a variety of routes you can take. This fascinating city is home to the world's oldest English language university. Many of the colleges are open to the public or offer tours of their historic buildings. Oxford has one of the world's oldest public museums - the Ashmolean, lots of atmospheric pubs like the Turf Tavern, a hotel in a converted Victorian Prison and more Harry Potter connections than you can wave a wand at. Use these resources to find out how to get there from the capital. It makes a great day trip or short break. Trains leave for Oxford Station every 5 to 10 minutes from Paddington Station. The journey takes about an hour. In the fall of 2017, standard round trip, off-peak tickets were about £25, but much cheaper round trip fares are available when purchased as two, one-way tickets, well in advance. UK Travel Tip The cheapest train fares are those designated "Advance". How far in advance depends upon the journey as most rail companies offer advance fares on a first come first served basis. Advance tickets are usually sold as one-way or "single" tickets. Whether or not you buy advance tickets, always compare the "single" ticket price to the round trip or "return" price as it is often cheaper to buy two single tickets instead of one round trip ticket. And, if you are a bit flexible about the time you can travel, don't forget to check the Cheapest Fare Finder feature on the National Rail Enquiries website. The Oxford Tube is a very popular way to get to Oxford by bus. The company runs buses 24 hours a day. They leave London Victoria Coach Station every ten to 15 minutes, throughout the day and have frequently scheduled departures throughout the night. The trip takes about an hour and 40 minutes. The Oxford Tube has pick -up points from multiple stops in London and in Oxford. The fare costs £15 one way or £18 for same-day round-trip. There are multiple trip deals, as well as student, senior and child fares available. National Express run coach trips to Oxford Bus Station from London Victoria Coach Station virtually round the clock. Buses leave every 15 minutes during peak times. The journey takes about an hour and 40 minutes. Round trip tickets for specific, booked trips cost £19.00. Open return tickets that can be used up to three months after purchase cost £21.50. Tickets can be booked online. UK Travel Tip It's always worth checking Megabus to see if there's a journey available that meets your travel schedule. The super discount service offers bus trips on this route for as little as £5 each way. But you may not have as much choice about scheduling as with a regularly scheduled service. Oxford is 62 miles northwest of London via the M4, M25, M40 and A roads. It takes about an hour and a half to drive and as a commuter route using motorways, it's not a very interesting drive. If you do go there by car, you will be in the middle of the Cotswolds, a great touring area, and within a short drive of Blenheim Palace. Keep in mind that gasoline, called petrol in the UK, is sold by the liter (a little more than a quart) and the price is usually more than $1.50 a quart.